Authors: Robert E. Farrell, Jr. This laboratory guide represents a growing collection of tried, tested and optimized laboratory protocols for the isolation and characterization of eukaryotic RNA, with lesser emphasis on the characterization of prokaryotic transcripts. Collectively the chapters work together to embellish the RNA story, each presenting clear take-home lessons, liberally incorporating flow charts, tables and graphs to facilitate learning and assist in the planning and implementation phases of a project. 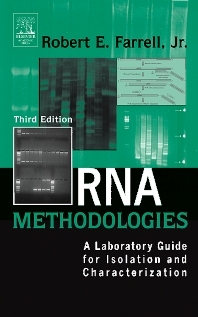 RNA Methodologies, 3rd edition includes approximately 30% new material, including chapters on the more recent technologies of RNA interference including: RNAi; Microarrays; Bioinformatics. It also includes new sections on: new and improved RT-PCR techniques; innovative 5’ and 3’ RACE techniques; subtractive PCR methods; methods for improving cDNA synthesis. Researchers, graduate students and lab technicians in the fields of molecular biology, cell biology, and biochemical genetics. Dr. Robert Farrell is a bench-current scientist who has 35 years of experience working with RNA in the study of transcriptional and posttranscriptional regulation of gene expression in a variety of model systems. He is also experienced in animal cell culture methods. Prior to joining the faculty at Penn State University, he operated a biotech education and service firm, winning the 1998 Small Business Contractor of the Year award from the U.S. Department of Agriculture. He is the recipient of campus- and college-wide awards for excellence in teaching, and has extensive experience running RNA and specialized biotechnology hands-on laboratory training programs all over the world. He often serves as a consultant within the pharmaceutical and biotech industries. Dr. Farrell received his Ph.D. and M.S. degrees from The Catholic University of America and his B.S. in Biology from Providence College. Dr. Farrell currently serves as the campus academic officer at Penn State York.